Killswitch Engage guitarist Adam Dutkiewicz and former KsE vocalist Jesse Leach are reteaming for Times of Grace, a brand new band that finds the duo taking a creative left turn, boldly exploring new musical terrain, while fearlessly digging deep into the recesses of their musical synergy and coming up with a provocative, heavy-yet-melodic result, one that helped each of them overcome personal struggles and emerge from the darkness, more empowered than ever. The pair’s collaborative energy and chemistry obviously yields quality, long-lasting results, as they worked together on KsE’s benchmark album, 2002’s Alive or Just Breathing. That record has become definitive for an entire generation of American metal, with Leach’s voice and uplifting lyrics serving as one of the key elements that propelled the album to “modern classic” status. Leach, who went on to sing for the more classic-rock leaning Seemless and who currently sings for the metal band The Empire Shall Fall, was always remembered fondly by KsE fans, even though he left the band shortly after Alive or Just Breathing’s release. While fans will no doubt be thrilled at the concept of the duo reuniting, Times of Grace, however, are not interested in fashioning Alive or Just Breathing, Part II. It’s an entirely new project and represents a different musical path for both Adam D. and Leach! It is an album of cleansing and catharsis for each of them, where internal demons were exorcised and set to music that’s as aggressive as it is melodic. The pair are currently in the studio working on their debut, The Hymn of A Broken Man, which is due out November 9 through Roadrunner Records. Adam D. also commented on what Times of Grace means for him personally, saying, "Making this record was something completely new for me. It documents some of the most difficult, yet spirited times of my life in the past three-and-a-half years. A lot of the music and lyrics just came out of me while going through several internal struggles, and writing these songs were the only comfort I could find. I reached out to Jesse to help sing and write these songs with me because of my respect for his musical abilities, and because of our great friendship...one that seems to not change no matter what happens in our lives. “In the end, I am very proud of this record, and I feel it has helped me through some of my darkest days. I'm hoping that people will enjoy it, and also that it can maybe help others to keep the most positive mindset, even through the most trying of times." The album begins with the percussive, almost militaristic “Strength in Numbers,” which pairs layered vocal melodies with thunderously roaring drumbeats; “Fight For Life” bites with ferocity, but is balanced out by Leach’s emotive vocals; while “Willing” boasts a more contemplative yet just as feral vibe. 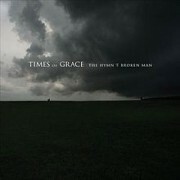 Times of Grace aren’t going back over ground that its members have already covered; they’re moving forward, incorporating stunning, eye-arresting visuals alongside their music, which features rich layers of instrumentation that invite the listener to sift through.